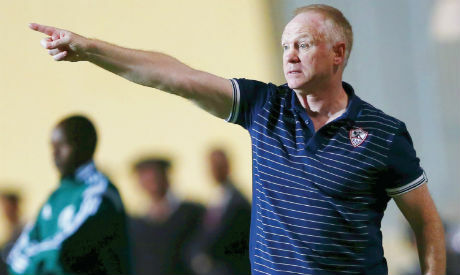 Zamalek have sacked their fourth coach of the season as team leadership and coach Alex McLeish made the mutual decision to end his tenure at the club on Monday. The 57-year old Scot was appointed in February, but after a string of unconvincing performances that saw the defending league champions fall 11 points behind arch-rivals Ahly he was shown the door. Outspoken chairman Mortada Mansour revealed his frustration over the team’s recent form and sacked McLeish's two assistants earlier on Friday. The former Rangers boss agreed to halve the 3-month penalty clause stipulated in his contract and will receive 60,000 dollars as compensation for his termination. Recently appointed assistant coach Mohamed Helmi will serve as interim coach and will be in charge of the team's next game against Talaie El-Gaish on Tuesday. He is set to be the sixth man in charge of Zamalek this year. Last season the team had a change in leadership four times. Brazilian tactician Jesualdo Ferreira, who led the team to the domestic double for the first time since 1988, quit the team in November after a series of confrontations with the club’s president. Marcos Paqueta, another Brazilian, lasted only for one month after failing to meet expectations. Former Egypt and Tottenham, striker Ahmed Hossam, popularly known as “Mido,” took over in his second spell at his boyhood club but also failed to meet expectations and was sacked in February. Mohamed Salah was named the interim coach preceding McLeish's appointment in late February and led the team in a number of games. It is not clear yet whether Mansour will be looking for an Egyptian or foreign coach to lead the team during the remaining 10 games of domestic league and African Champions League action.